I have had the opportunity to work alongside many teachers who find themselves early in their careers. This opportunity for me is always educative, allowing me to continue to consider experiences we as teachers had as children in school. I have come to understand, we (teachers) often return to what we know about school and what we experienced as students. When it comes to planning with teachers around elementary physical education, I am often asked for a list of new games to play. Last week when working with a teacher, we compiled a number of resources which contained a multitude of games that can be played with students from a variety of grade levels. One simply needs to Google PE Games and the options are endless. When I was a student many moons ago, the games we engaged in were your typical sports of the season. Floor hockey, basketball, volleyball, badminton, mixed in with a constant supply of dodgeball are my memories of elementary school physical education. A Google search today still includes many of these common sports, however you will also find many games that perhaps look different, focusing on a conceptual approach to sport and to games. What follows is an excerpt from a chapter written with my friend Nathan Hall taken from Quality Health and Physical Education: Pedagogical Practices and Considerations for Canadian Elementary School Teachers (Barrett & Scaini, in press). I begin with a story fragment of an elementary student’s experience. Our teacher blows the whistle to signal the start of class. We put away the basketballs we were playing with and circle up to listen to the teacher tell us what will happen today. When she says today we’re continuing with our basketball unit lots of kids cheer and get excited. But I feel my stomach sink—I’m not good at basketball. We start by working on what the teacher calls “skill development”, working through drills that will help us get better at basketball. I think I am getting better but I still sometimes have to chase down the basketball or I mess up the drill for others. “Now it is time to put our skills to work”, says our teacher. The class is divided into four teams, and all of them have very good players and players like me. While we play, I try to get involved, but have no idea where to go. I see my teammates passing the ball around me, not to me, even though I’m open and waving my hands. Why won’t they pass it to me? If they do pass it to me, what do I do with it? What if I miss the pass? I don’t want to let my teammates down. I guess I will just keep running up and down the floor, following everyone until our teacher tells us we are done for the day. Perhaps you can remember similar instances from your own experiences in physical education. Reflecting on the story we wonder if knowledge and skills are being developed while running up and down the floor, following everyone until our teacher tells us we are done for the day. What games could be selected or designed to support a greater understanding? How do we plan to ensure all students see success and develop the knowledge and skills required to play basketball or any other sport/game for that matter? Traditionally, the starting point for planning physical education lessons revolved around seasonal sports (basketball) or popular games that many students found enjoyable (capture the flag). From this perspective, the game is the focal point of the lesson, working through drills that will help us get better at basketball. What if the starting point for planning was not the game itself? Stephen Covey (1998) talks about the importance of beginning with the end in mind. This notion of starting with a clear understanding of the destination is echoed in McTighe and Wiggins’ (1999) Understanding By Design framework. The emphasis within this framework, known as backwards design, is a process commonly used today by educators. When planning using backwards design, the teacher begins with the question; what is the goal or big idea? The answer to this question leads to the creation or planning of assessments, then lastly the development of the lesson plan (McTighe and Wiggins, 1999). Why won’t they pass it to me? If we consider this question thinking backwards, we now have a new starting point for planning. 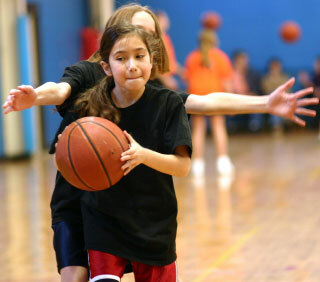 A goal or big idea within games such as basketball is getting open to receive a pass. If we plan with this goal as our starting point, the selection or design of games become more specific and intentional. The games within the lesson will help students to understand what it looks like to be open. With this approach perhaps fewer students will ask the question, why won’t they pass it to me? So when it comes to games within an elementary physical education program, we know it is more than just finding a game to play. Our starting point for planning is not the game. We start by asking what is the goal or big idea we are looking to support? As discussed, this essential question is what needs to drive game selection and/or design. The starting point when planning is no longer centred on the game. Instead, beginning with the end in mind (Covey, 1998; McTighe and Wiggins, 1999) ensures students are not simply playing games but learning from games. What other factors are important when selecting or designing games? When I think about implementing games with elementary students I always consider the inherent risks involved and ensuring the games are as safe as possible. It is also imperative to consider the equipment needed to ensure the games are not only safe, but also educative. Considering the developmental level of students by implementing oversized, lighter, or lighter equipment is much easier today than it was 20 years ago. Many physical equipment vendors now have a plethora of equipment geared towards elementary age students. Considering safety as well as developmental levels allows me to also think about how a game can be altered or tweaked to support multiple skills levels. Infusing games within a lesson that can be adapted to suit multiple skill levels goes a long way to ensuring students are engaged in the lesson. A particular game can be altered to focus on a particular Big Idea. One does not need to constantly be introducing new games. Sometimes, the adjustments made to a game allow teachers to focus on particular learning outcomes. Connecting Games to Outcomes provides examples of how altering games can challenge students and connect to a starting point, a Big Idea. It is this notion of teaching games with a purpose that I continue to think about when challenging students in the gymnasium. Rather than just playing games, we continue to find ways to educate each other through games. Covey, S. R. (1998). The 7 habits of highly effective people. Provo, UT: Franklin Covey. Hall, N., & Lewis, B. (in press). Using games to teach physical education. In J. Barrett & C. Scaini (Eds. ), Quality Health and Physical Education: Pedagogical Practices and Considerations for Canadian Elementary School Teachers. Windsor, ON: Human Kinetics. McTighe, J., & Wiggins, G. P. (1999). Understanding by design handbook. Alexandria, VA: Association for Supervision and Curriculum Development.